1. Wash and cook potatoes till soft. 2. Peel and skin and mash it. 4. 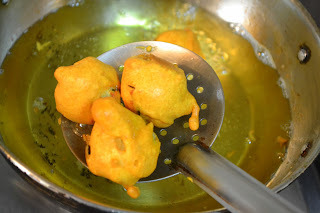 Let it see how to make batter to dip the potato balls. 5. In a mixing bowl, take gram flour (besan flour or kadalai maavu), rice flour, red chilly pwd, baking soda, salt, turmeric pwd and pepper pwd. 6. Add warm water little by little and mix it to smooth paste. 7. The consistency of the batter shouldn’t be runny. 8. Heat oil in a frypan. 9. Add mustard, curry leaves, split urad dal and cumin. 11. Add finely sliced green chilly and ginger. 13. Add turmeric pwd and salt. 14. Add the cooked and mashed potato. 15. 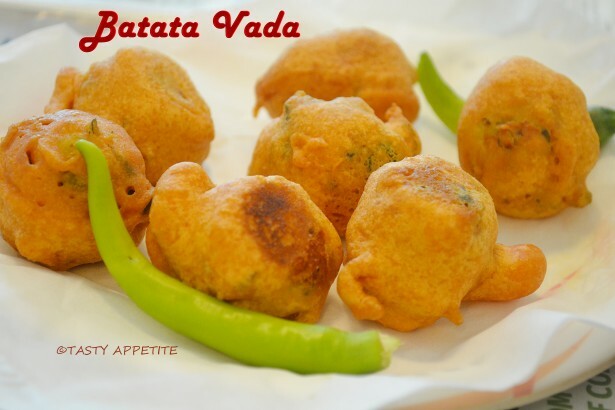 Combine together with the masala. 16. Cook covered in low flame for 5 mins. 17. Squeeze few drops of lemon juice. 19. Sprinkle finely chopped coriander leaves. 20. Allow to cool and make it to small round balls. 21. Heat oil in a fry pan to deep fry the vadas. 22. 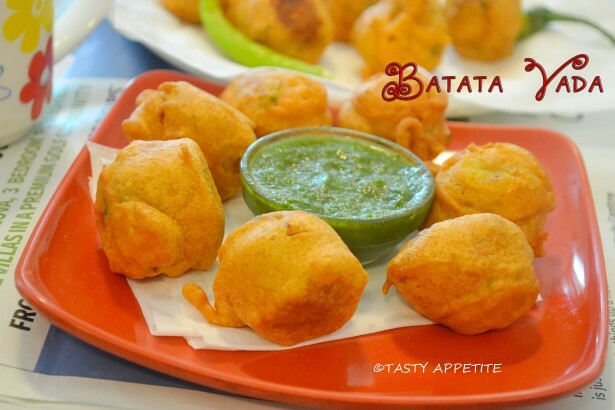 Take one potato ball, dip it in the batter. 23. Drop carefully in the hot oil. 24. 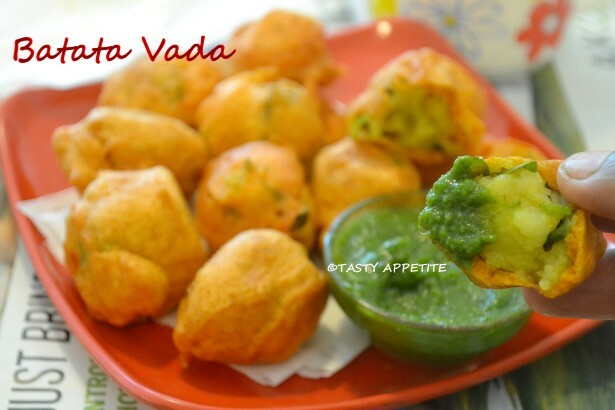 Deep fry until the vadas turn golden brown all over. 25. Strain and remove in kitchen tissue. 26. 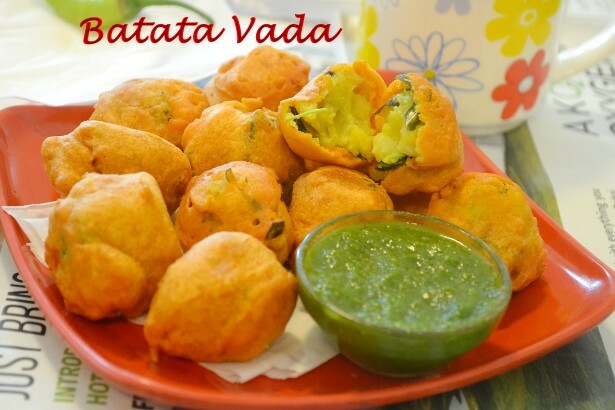 Lipsmacking delicious batata vadas are ready. 27. 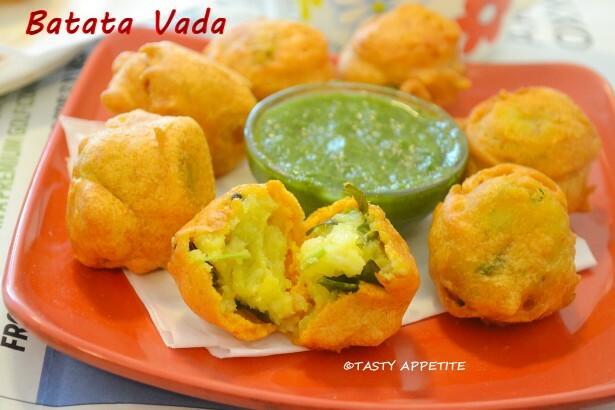 Enjoy hot with mint chutney or any dip of your choice. As usual, fantastic..Jay! I am entering this blogging world with my newly created blog www.vegdivine.blogspot.in . Hoping to get your support..
Looks very yummy and tasty! !